Imax box offices set a new record over the Chinese New Year period starting on Feb 5, grossing 217 million yuan ($32.3 million) across its 599 theaters in China. Imax Corporation and Imax China said in a news release on Feb 11 that the results were driven by the strong performances of three local-language films – The Wandering Earth, Crazy Alien and Pegasus. The sales figures marked Imax China's best Chinese New Year performance ever, up 40 percent year-on-year. 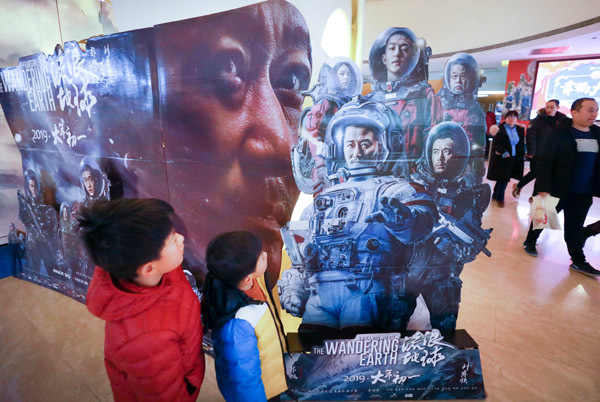 The Wandering Earth, China's first big-budget sci-fi film, led the pack by grossing more than 185 million yuan in Imax theaters to become the highest grossing local-language film in Imax history, surpassing Mojin: The Lost Legend. Imax screenings accounted for more than 9 percent of the film's gross overall takings. The film also set new Imax records for the biggest opening week, surpassing Avengers: Infinity War, as well as the biggest single day and best three-day performance for a local-language title. "We are very pleased with these record-breaking Chinese New Year results, which are particularly significant when compared to 2018's record performance that was up 80 percent over the previous year," said Imax CEO Richard L. Gelfond. "We believe these results clearly highlight the strong consumer demand in China for the premium Imax experience and the power of the Imax network for launching high quality, blockbuster content. That content includes The Wandering Earth, the first Chinese sci-fi film which will, no doubt, spur additional projects in the genre," he added. The Wandering Earth was also released exclusively in 33 Imax 3D theaters in North America on Feb 5, three days ahead of its wider release, grossing $775,000 for a per screen average of $23,500 and setting a new record as Imax's highest grossing Chinese release in the market.